What will Facebook do with $9 billion? 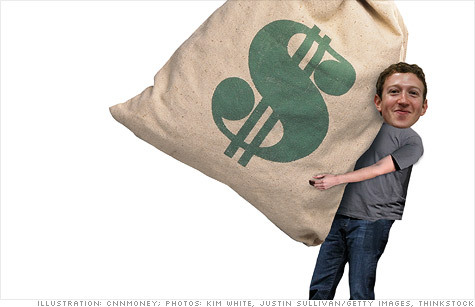 Facebook already has billions in cash on hand, and it's about to raise billions more. NEW YORK (CNNMoney) -- Facebook has finally filed to raise $5 billion through a public offering. But it hardly needs the cash: The company already has almost $4 billion stashed in its piggy bank. In its IPO filing, Facebook gave standard (boring) boilerplate explanation of what it'll do with the cash it raises: "working capital and other general corporate purposes." Nearly $9 billion is a lot of working capital. Facebook could use it to beef up four key areas. Ramp up mobile. Facebook's filing to the Securities and Exchange Commission warned potential investors several times about its weakness in mobile. "We do not currently directly generate any meaningful revenue from the use of Facebook mobile products, and our ability to do so successfully is unproven," the company wrote. Facebook wasn't built with mobile in mind -- it was created in 2004, after all -- and it's been slow to develop device-optimized apps. Facebook for iPad, Apple's (AAPL, Fortune 500) tablet, wasn't launched until October. That was 18 months after the iPad launched, and Facebook's delay gave third-party apps a chance to jump in. The biggest opportunity in mobile: advertising. The company doesn't yet serve ads to users who access Facebook through apps or its mobile site. Package more data. Facebook had 845 million monthly active users as of December 31, which means lots of tasty bits to sell to advertisers. "Facebook's product is data, period," says Rebecca Lieb, a digital advertising and media analyst at Altimeter Group. "Boy, do they have a lot of it and boy, are they going to get more of it." That increased data payload comes as Facebook continues to expand its tentacles deeper into the Internet beyond its own site. User profiles have long been an easy way for advertisers to target -- "I like 'The Big Bang Theory' and The Gap" -- but now Facebook is connected to a lot else that its users are doing online. If you listen to a song on Spotify, watch a video on YouTube or read an article on The Washington Post, that activity could be posted to Facebook. In turn, Facebook can package that data in ways that help advertisers piece together your interests -- and decide which kinds of ads you'll respond to best. "It's one thing to have eggs and flour and sugar -- it's another thing to have a cake," Lieb says. "What you like on Pinterest, which TV shows you watch ... all of this helps inform ad decisions, and the more information the better. " Streamline ads. Of course, all of this potentially valuable data means squat for advertisers unless users are exposed to and engaging with the ads served. Advertising accounted for 85% of Facebook's total 2011 revenue, or almost $3.2 billion. To date, most of Facebook's ads have been display ads: banners, images and other graphics. Facebook is serving those ads to a hugely massive user base. In the third quarter of 2011, Facebook served 28% of all U.S. display ad impressions -- more than Google (GOOG, Fortune 500), Yahoo (YHOO, Fortune 500), Microsoft (MSFT, Fortune 500) and AOL (AOL) combined. "Facebook is serving so many display ads, but businesses are asking: How do we get leads off of this?'" says Jed Williams, a social/local media analyst at research firm BIA/Kelsey. "It's getting to the end of the experimentation period," he adds. "Facebook ads have to drive bigger performance than they have in the past. They feel the weight of that pressure." In response, Facebook has begun integrating ads directly into users' content feeds. These "sponsored stories" -- which sparked users' ire when they launched in January 2011 -- take a few forms, and they hawk brands that you or your friends have interacted with on Facebook. "Sponsored stories is emblematic to me of the big push Facebook is making around ads in the social graph," Williams says. "They're going to keep iterating and finding new ways to personalize ads." 0:00 / 2:36 What will Facebook do with its billions? Attract talent. Tapping into new revenue streams is unquestionably important for Facebook, but so is hiring people to create its products. One method is acquisition. Facebook likes to buy startups, kill their products, and deploy their engineers on new projects. Facebook's chief technical officer, Bret Taylor, came in the door that way. So did Facebook's head platform engineer, Carl Sjogreen, and dozens of other executives. Facebook referenced the "acqhiring" practice in its IPO paperwork, saying that it intends to continue that strategy. From a traditional hiring standpoint, Facebook will likely have to rethink its compensation packages. Startups often sweeten the salary offer by throwing in attractive company equity. "They can't attract people with those lovely pre-IPO shares anymore," says Lieb, the Altimeter analyst. "Silicon Valley engineers are high in demand, and you have to find a way to bring them to your company."